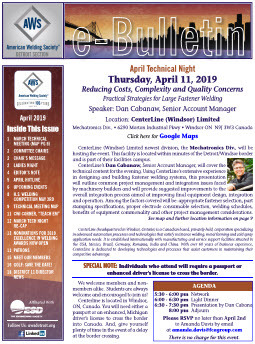 Learn about all of the latest welding news in Detroit, Michigan, by subscribing to the AWS Detroit Section online bulletin. Ask us about our great bulletin advertising opportunities. Welcome the year with our online bulletin! It has all of the latest welding news and events. The last printed bulletin was the December 2012 issue, so be sure to sign up to receive the online bulletin via email. Please note the dates for bulletin submissions. Late submissions will not be included in the current bulletin, so please submit on time! To submit pictures, articles, or information to the bulletin editor, please contact Robin Michon by email at bulletineditor@awsdetroit.org. Please submit all pictures and images in a high-quality format. Enjoy your summer. See you next fall (September 2016). Associate your brand with the most trusted welding society, through one of the most active sections, the "Detroit Section" of the American Welding Society. Don't miss the opportunity to digitally market your message and information to our bulletin's 1000+ members and businesses. Receive qualified leads that have been exposed to your sponsor message. Click below for further info, price break down in PayPal pull down. The bulletin is full of all the latest welding news. 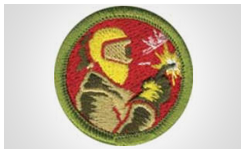 We have published stories about how the Boy Scouts of America™ introduced their first-ever welding merit badge and much more.